Camelot is one of those musicals I’ve always heard mentioned but I’ve never seen it or really heard any music from it. 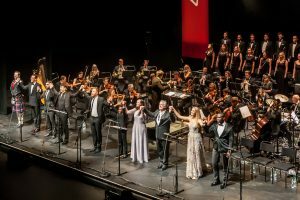 I was therefore delighted to be given a chance to discover it with the London Musical Theatre Orchestra (LMTO) and a stellar line up of soloists at the London Palladium. Camelot tells the tale of King Arthur, his Queen Guenevere and Lancelot, the knight with an unblemished record who risks loosing it all for love. This version was presented as a concert, with the music (and even previously cut songs) performed in full but the dialogue abridged for this version. The focus on the music was a sensible decision. The story itself is pleasant enough but it is the music that really grabs you. From the moment the overture starts the orchestra, conducted by Freddie Tapner, grab your attention with the soaring melodies and goosebumps ran down my spine. 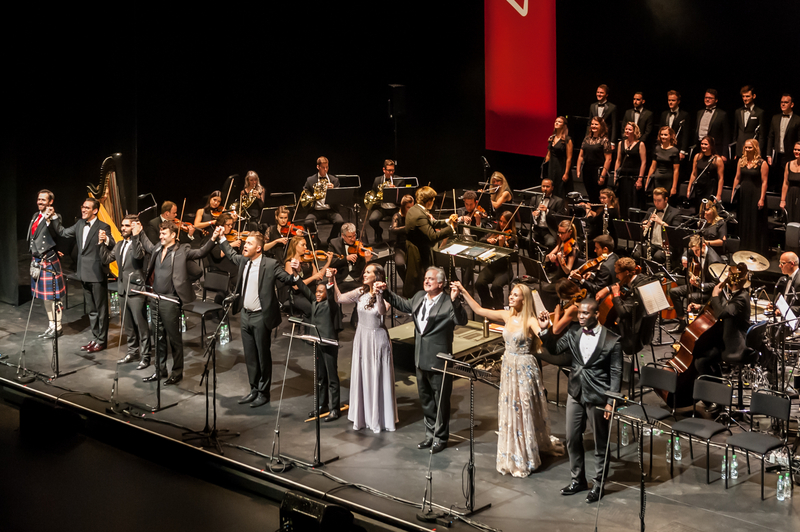 The principal cast have a lot to live up to, accompanied by such a wonderful orchestra but the combination of this cast and orchestra was faultless. David Thaxton takes on the role of Arthur. From the moment he starts as Arthur the audience hangs onto his every word. He captures the essence and naivety of Arthur brilliantly and his energy fills the stage. His wide eyed enjoyment as he starts to produce his own ideas of a land without boarders was palatable. Lancelot is played by Charles Rice who has one of the most stunning baritone voices I have heard. 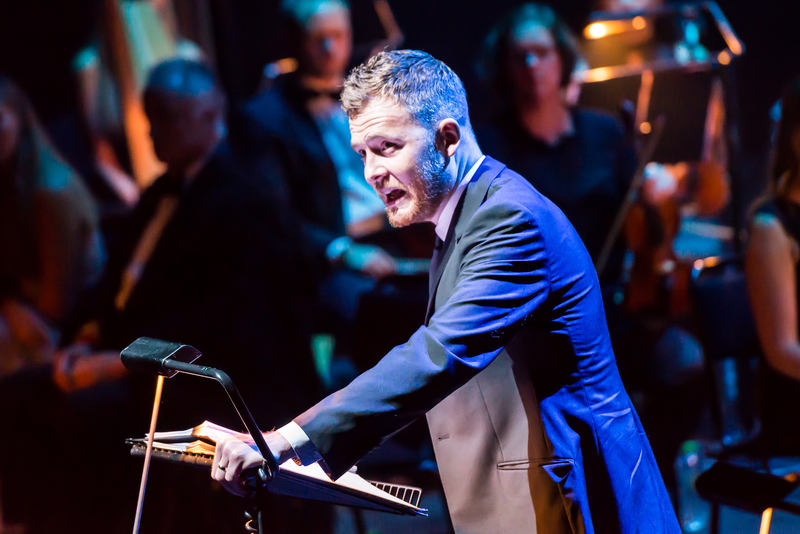 His rendition of ‘If I Ever Leave You,’ caused the applause to ring round the auditorium for a considerable while. Savannah Stevenson plays Guenevere. This is a role that could potentially be portrayed as simply a woman in love and with little depth however Stevenson delivers Guenevere as a medieval feminist, a take on the part I thoroughly approved of. Clive Carter played Merlyn and Pellinore and he is a true master at audience manipulation. He received a spontaneous applause after one of his scenes for his part in the unfolding drama. The remaining knights were played by Matthew McKenna, Emmanuel Kojo and Oliver Savile who along with the male company members delivered a rousing version of ‘Fie On Goodness,’ leaving me to wonder why this number was ever cut. Celinde Schoenmaker played the small part of Nimue, a spirit. She delivers ‘Follow Me,’ with stunning clarity and it is a shame that someone with such a stunning voice did not feature more. As you would expect in a concert the staging was simple but executed well with moments of comedy with the music stands and Thaxton clambering on a chair when he was hiding on a tree. Mention must also go to the production sound engineers. The soloists were crystal clear and balanced well against the large orchestra. A combination of spot on casting and loving delivery of the score has caused me to question why Camelot has not been in the West End for 30 years, if it is even half as wonderful as this production was it would be a sure-fire hit. To find out more about LMTO visit their website. If you like this review you might also like my review for 42nd Street, Chess and Strictly Ballroom.